As industrialisation has increased the world over in recent years, so too has the amount of waste metal parts on scrap heaps. But just as one man's trash is another man's treasure, one college art teacher from Taiyuan, in north China's Shanxi Province, is using industrial waste to create sculptures. To many, this is just waste metal. But to 40-year-old Huang Qicai, these are the building blocks of his masterpieces. Huang, who teaches art at a university in Taiyuan, has completed more than 200 of these iron sculptures over a decade, with roughly half of them having been sold. This horse is one of Huang Qicai's favorite works. It took him over three months to complete. Can you guess how much it weighs and how many metal parts it uses? "This horse sculpture is called The Last Unicorn. It weighs about half a ton and uses over five hundred metal parts. Its hooves come from a discared pommel horse. The double-fold eyelids make it more female. And here I put an old kitchen knife and wrench to form part of its body," Huang said. Huang Qicai used to make iron sculptures in Beijing. Since returning to his hometown, he has rented a farmyard in order to continue making his sculptures. As a frequent visitor to local recycling centers, Huang has spent almost all of his earnings buying waste metal parts totalling hundreds of thousands of yuan. "I believe every waste metal part contains the wisdom of its designers. They are works of art as they are. I want to use them to create something new, and make them alive again," Huang said. Huang believes his sculptures bear witness to China's rapid and ongoing industrialization. "The number of cars in China has increased rapidly in recent years, which has exacerbated problems like traffic congestion and air pollution. 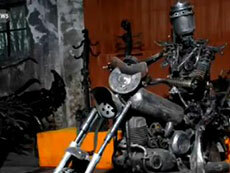 So I've used lots of scrap metal from old cars in my sculptures to mark the industrial age," Huang said. Huang Qicai has recently been working on the sculptures of the twelve animal heads from traditional Chinese culture. Huang plans to include more cultural elements in his future works, and he also hopes to construct larger scale sculptures to serve as symbols for China's cities.